It's best to learn how to gallop your horse in a ring or enclosure, so that if he gets too excited, he won't run very far as he would if he were on the trail or in an open field. It's also a good idea to wear a safety helmet with chin strap when learning the gallop in case your horse stumbles during this fast gait and you tumble off his back. Galloping is divided into two types: the hand gallop and the regular gallop. The hand gallop is a three-beat gait in which the horse's inside hind leg and outside foreleg hit the ground together, and then the inside foreleg and outside hind leg strike the ground independently. The gallop is a four-beat gait in which every leg hits the ground separately. The four-beat gallop is the fastest equine gait, with Thoroughbred race horses galloping a record 40 miles per hour. 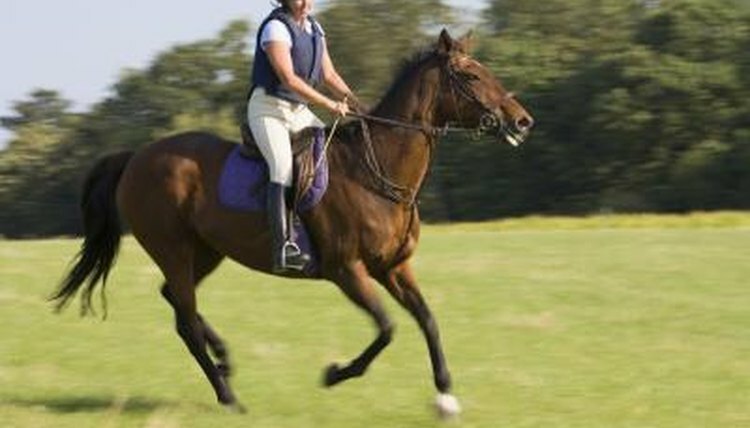 In English and Western riding styles, riders rise slightly out of the saddle during the gallop. English riders assume a special position called a two-point or jumping position. The calf and thigh are the two points of contact with the saddle. To assume a two-point position, sink your weight into your heels and let the ball of your feet rest on the stirrup irons. Rise up slightly in the saddle, resting the thighs on the saddle. The hands rest a few inches up on the horse's neck with the reins making a straight line from the bit to the rider's hands. Advanced riders carry the hands slightly above or to the sides of the horse's neck. To transition into the gallop from the canter or lope, rise into the two-point position with your weight firmly in your heels. Cluck softly to your horse, and move your hands forward and up into the mane. Urge your horse forward with your leg if you need him to pick up speed. For the hand gallop, maintain the three-beat gait. Squeeze slightly with the leg and loosen the reins to urge the horse into the four-beat gallop. Transitioning from the gallop back to the walk should be done subtly so you don't hurt your horse's back. From the two-point, sink gently back down into the saddle so that you return to three-point position with seat, thigh and calf in contact with the horse. Don't thump down hard or jerk the reins back; this can hurt the horse's back and mouth. Draw the reins back gently and say quietly, "Whoa" or "Walk, please." By sinking your weight back and down into the saddle, your horse feels the shift in weight and should return to a quiet walk.